To sing means to produce music with the help of an instrument that a person has from the time of birth — a voice. Singing can be described as the act of performing vocal music or simply putting poetry, stories or ideas to a rhythm that an audience can enjoy. The art of singing is considered as one of the finest accomplishments of the human spirit. The famous singers listed on this website are widely known throughout the world for their talent and potential. Whether their vocal style is soothing or harsh, high or low-pitched, soft or roaring, they have all earned a reputation for their skill and technique. 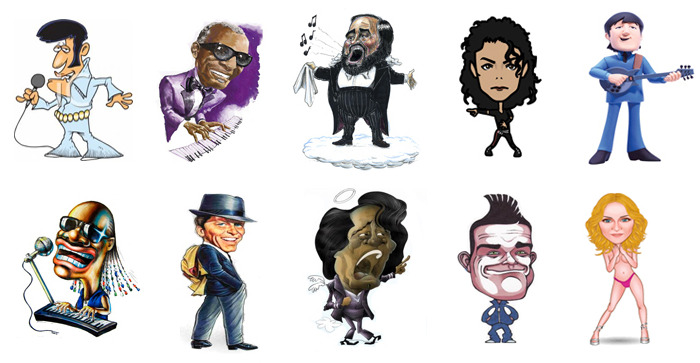 Many of these famous singers have extensively trained their voices through years of lessons, vocal exercises and practice. On the other hand, others have been born with the natural ability to sing wonderfully without any formal training. Most of them have dreamed of a career in singing since their childhood, while others have stumbled into the profession incidentally. The vast majority of these male and female singers from diverse genres such as jazz, opera, soul, gospel, blues, rock and pop have musical talents in addition to singing. Their skill on instruments such as the piano or the guitar, and songwriting capabilities have contributed to their individual successes as musicians; nevertheless, it is their singing voices that have brought them fame, fortune and international attention.